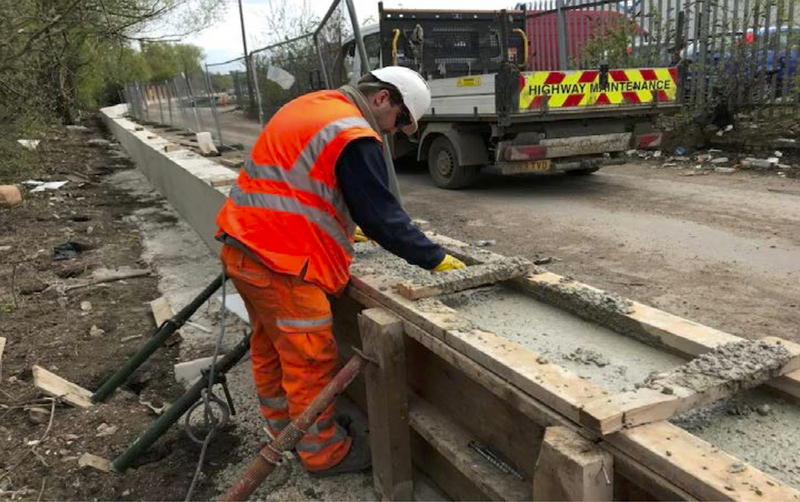 Businesses in the Stourton area of Leeds are benefitting from increased flood protection following the completion of a new 730-metre flood defence wall and property level protection, such as flood gates and demountable barriers. As well as the new flood defence wall along the boundary of the Haigh Park Road Industrial estate with the Aire and Calder Canal, property level protection has been installed at four businesses and one Northern Power Grid site. This has involved supplying 17 aluminium demountable barriers that can be installed by the businesses across door openings in the event of a flood, where surface water flooding could occur due to the water being prevented from discharging into the canal or river as normal. Towngate Plc is an industrial property agent that manages around a dozen commercial properties in the Stourton Industrial Estate. All of its tenants were impacted in the December floods. “We were delighted when we were informed of the flood defence plans in Stourton. We understand that projects like this take a while to get off the ground and we were surprised at how quickly it took Leeds City Council and the Environment Agency to make the announcement. The Leeds Flood Alleviation Scheme is led by Leeds City Council in partnership with the Environment Agency and is split into two phases. A big contribution to the flooding at Stourton was the breach of the river and canal at Knostrop. Stourton is located downstream of Phase 1 of the new Leeds Flood Alleviation Scheme and at the time of Storm Eva, Phase 1 of the project was under construction, so it didn’t provide any flood risk benefit to Stourton. In October last year, the £50 million Phase 1 of the Leeds Flood Alleviation scheme was officially opened which now provides a 1 in 100 year standard of protection. During construction, there was a repair to Knostrop by-wash with strengthening works including sheet piles. Work also involved the construction of moveable weirs at Crown Point and Knostrop and the removal of a manmade island which separated the canal and river, known locally as Knostrop Cut. The weirs can be lowered when high river flows are expected, to help lower the river level. This work will help protect from another breach happening as it did on Boxing Day, and provide additional protection to Stourton. The completion of work at Stourton comes as an outline business case for phase 2 of the scheme has been submitted to government, which outlines plans to reduce flood risk to the city upstream of the city centre, taking a catchment wide approach.Phase two identifies measures further upstream including the Kirkstall corridor which was badly hit by the 2015 Christmas floods. It also looks at areas beyond the city boundary to further reduce the possibility of the river flooding in Leeds, as well as additional measures to offer protection for the South Bank area of the city centre which is a key future economic driver for Leeds. The phase two plans also have a strong focus on Natural Flood Management (NFM), with proposals to create new woodland areas which would more than double canopy coverage in the River Aire catchment. It also proposes water storage areas to be created and developed, operated by control gates system meaning water can be held and then released back into the river when safe to do so. A third element would be the removal of existing obstructions along the river to help reduce water levels, along with lowering the riverbed in places to improve its capacity and flow. Aside from these measures, phase two would also see some new infrastructure measures installed including landscaping, terracing, embankments and walls, but due to the range of natural measures the height of any engineered defences would not need to be as high as originally projected, typically averaging 1.2 to 1.5 metres in height. If approved by the government, proposals for the main works of Phase 2, created by Leeds City Council working with the Environment Agency and BMM jV Limited, would see work scheduled to begin in summer 2019.